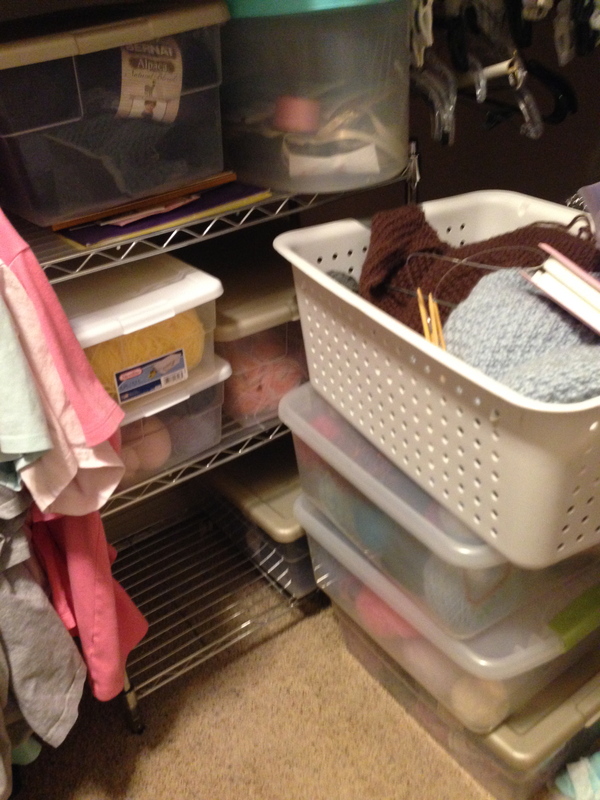 I have started a new blog here at WordPress with a single purpose…to document knitting through my stash. In an effort to be more frugal and organized, I’m endeavoring to use up a lot of my yarn this year. I’m encouraging you to knit along….and share what great stash buster patterns you love. My first order of business was to see exactly what I have. I keep most of my yarn in my closet. You can see it hasn’t been a very organized, accessible system. I had a lot of skeins in a LL Bean canvas bag, and some other things in their original bags. You might want to look through your fingers across your eyes…scary. My husband has been quite accommodating of my yarn issue. 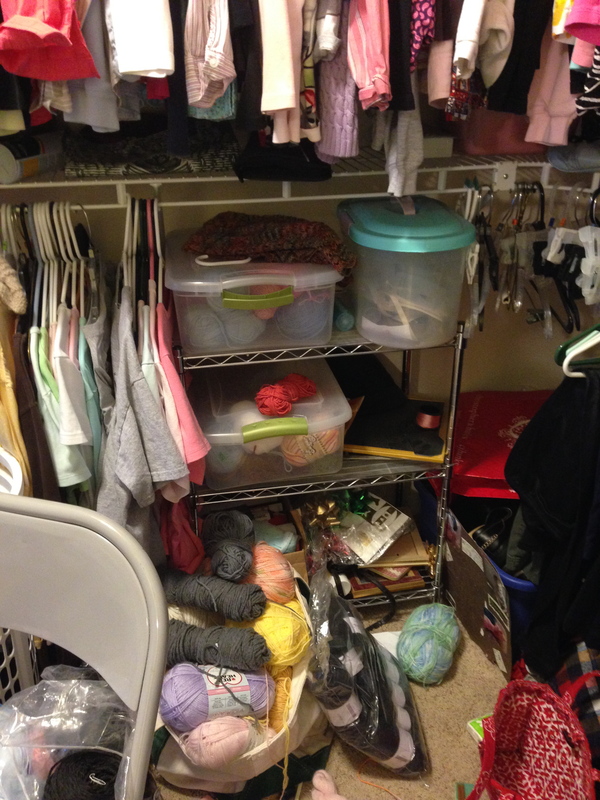 I sorted through and loosely organized according to whether it was wool, baby acrylic, or just odds and ends that are being added to a blanket. After spreading everything out on my bed, and regrouping, my closet is back to working order. No more yarn explosion. Clear plastic containers are the best! 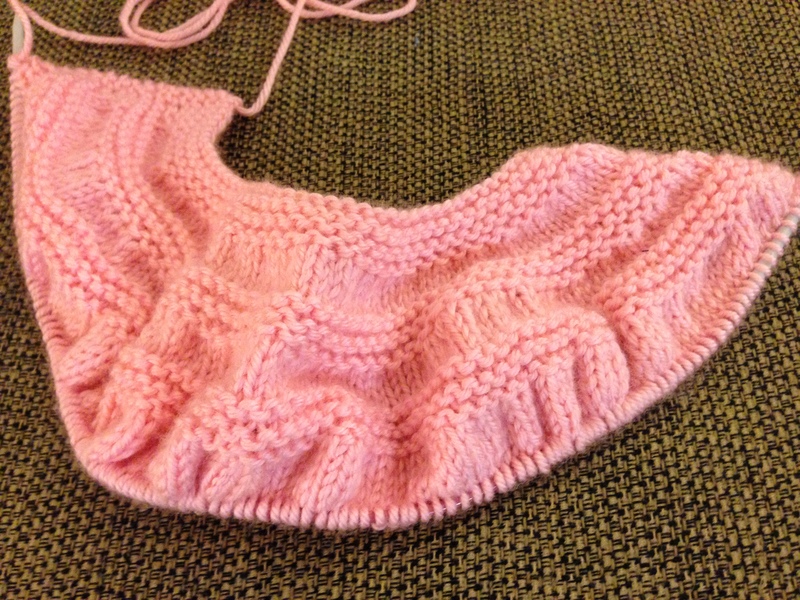 I did find my next project…a little baby girl cardigan that I have knit a few times before and I LOVE! It’s called, “In Three’s” you can find it on Ravelry. I started this over a year ago, and plan on finishing it quickly. I believe the yarn is an acrylic worsted, something like Vanna from Joann’s? I’ll poke around and see if I can find the label. I highly recommend this pattern, it doesn’t have any glitches and is so quick and easy! 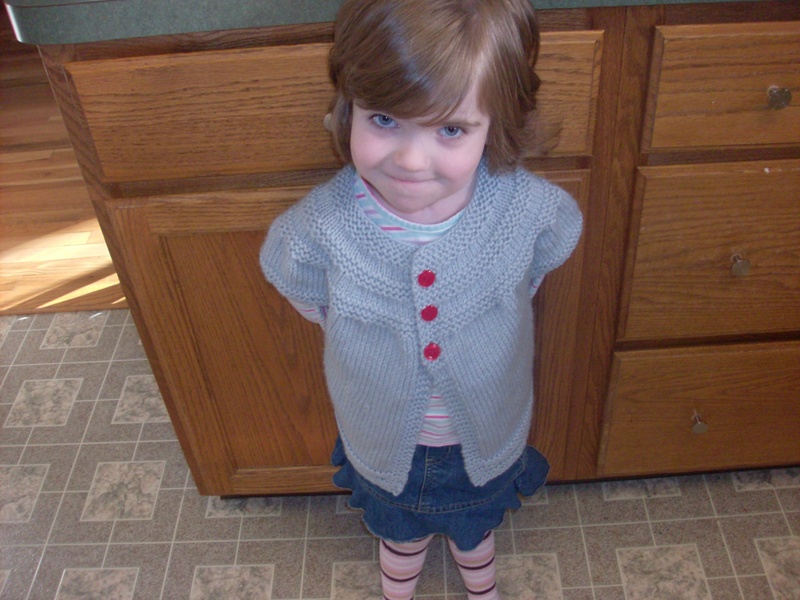 Here is a pic of the “In Three’s Cardigan” (from a few years back) I made for Lily. Adorable! She can still wear it! It has little sleeve caps, and is perfect for playing in but also dresses up nicely. I hope to be posting weekly with updates, which I might link to Ginny Sheller’s weekly Wednesday Yarn Along.